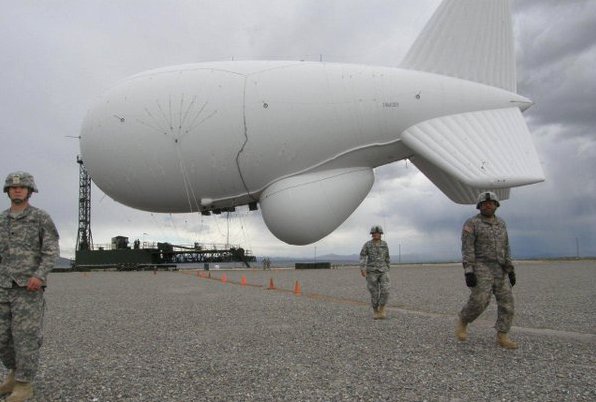 One of two tethered US Army aerostats that can be seen floating above Aberdeen Proving Ground, Maryland, has broken free from its tether and is moving in a northeast trajectory. The Joint Land Attack Cruise Missile Defense Elevated Netted Sensor System (JLENS) consists of both a fire control system aerostat and a surveillance aerostat and is undergoing operational exercises at Aberdeen Proving Ground. The surveillance aerostat detached from its mooring station at 12:20 p.m. EST today, NORAD spokesman Michael Kucharek told Defense News. The aerostat was last seen traveling over Pennsylvania and is being trailed by two F-16 fighter jets from Atlantic City, New Jersey, Kucharek said. UPDATE The blimp has been spotted over Bloomsburg, PA.